Vanessa Strickland - Actor/Artist/Puppeteer: First Dracula Review! 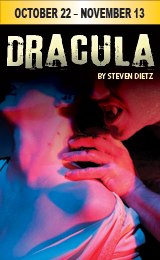 Our first review of Dracula at the Maryland Ensemble Theatre is out! "Much more high-camp than scary, “Dracula” weighs in as the best production I’ve ever seen in Maryland Ensemble Theatre history, stretching back for nigh onto 13 years." We run for 3 more weekends and sold out this opening weekend, so make your reservations and come on out to see us! We have a special 11pm show on Saturday, October 30th, so if you'd like to get particularly creeped out late at night (and in costume! ), please do join us! Tickets: Adults ($23.50), Students/Seniors ($20.50), Thursday & Sunday Evenings (All seats $16.50). Ticket price includes a $1.50 handling charge. Please do not order tickets online after 4pm on the day of the performance you wish to attend. Street parking is available or, you can make a left onto South Court St. and enter the parking garage. After 5pm, parking there is only $1 (exact change (coin or bill) required). Credit cards also accepted at parking machines.